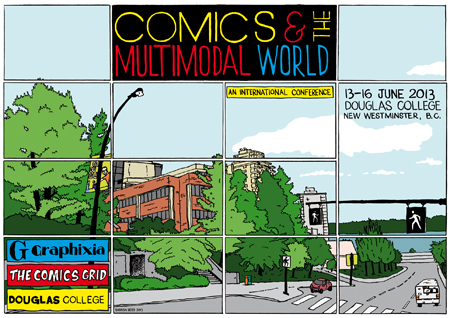 doug: Douglas hosts comics conference June 13-16 - and you're invited! Douglas hosts comics conference June 13-16 - and you're invited! Do you love comics? Are you interested in digital culture? Then get set to get your geek on at Comics and the Multimodal World, a conference that will see scholars from around the globe converge at Douglas College for four days of forums, interactive workshops, seminars and film screenings on everything from how female superheroes are portrayed differently in Japanese and American comics, to indigenous mythology in The Incredible Hulk, to the future of the printed book in the age of mobile and digital technology. And much, much more! The first three days feature interactive workshops that invite the audience to participate in making, testing and using comics. Thursday, June 13, is Student Day, which features roundtable conversations, a hands-on seminar/teach-in, film screenings and a special forum: "Comics, Computers, and the Future of the Humanities," 5:30-7pm, room 2201. There will also be an exhibit at the Amelia Douglas Gallery (till June 28, free) called "Sequential Investigations: The New Comics," featuring drawings, comics, and installations from an international group of comics artists. The public is welcome and encouraged to attend the conference. Douglas students can register for free, and discount rates are available for Douglas faculty and other post-secondary students in the Lower Mainland. See the list of conference fees. View the full program or read more about the conference. Register now! *Come back to this blog tomorrow for an in-depth interview with Douglas College conference organizers/comics experts Brenna Clarke Gray, Peter Wilkins and David N. Wright on why you'll love this event, and the changing nature of academic conferences.